The Geoscience Research Institute is located on the campus of Loma Linda University Health, an institution of higher learning that keeps Christian service at the core of its mission. 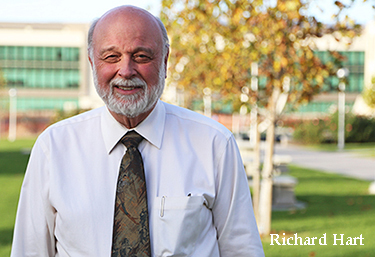 In this article, Dr. Richard Hart, the President of Loma Linda University Health, shares some personal reflections on the role of knowledge in the quest for meaning and greater understanding. In a world drowning in information, there is an even stronger search for ultimate truth. It seems the information age expects each of us to sort out misleading advertisements, internet “facts”, and professionally perpetrated misinformation in our own attempts to determine what is true. Even our recent presidential election and continuing political dialogue centers on the issue of what is really true. For those of us who feel that knowing truth and having confidence in our belief is not only important, but possible, this great search for truth is both concerning and even prophetic. This becomes even more evident when working in an academic health science institution like Loma Linda, where Biblical truths and scientific advances are both considered essential foundations of knowledge. So how do we tread this line in a world that is now fully captivated by the logic and power of the scientific method and its interpretation of the world around us? As someone who learned the basics of medicine over 45 years ago, it is clear that many of the “facts” of yesteryear are now debunked and a new set of “facts” has taken their place. Many diseases that had obvious explanations when I was a student are now shown to be something quite different in causation and treatment. Does this mean we are closer to the truth today than before? Or are we just taking our understanding to a different level, only to learn more in the future? I can apply the same concerns to the Biblical “truths” I was taught as a child. Growing up in rural northern Idaho, life was simple and it seemed the difference between right and wrong was clear. But exposure to the broader world has changed my views on many issues, including race relations, gender issues, addictions, Sabbath observance, impact of genetics, origins, and perhaps most importantly the human and even individual imperfections that influence our church teachings and doctrines. I can see different ways to interpret Biblical concepts that seemed so clear in one direction as a child, but are now more complex and nuanced. Does that mean I am straying from the “truth” or am I reaching a new level of understanding of God’s ideal for mankind? Coming back to Loma Linda, are there instructions - research boundaries - we should be insisting our faculty adopt and follow? Or are we brave enough to let truth take us where it will, believing that our God is the ultimate arbiter? There is a fascinating debate recorded in our board minutes from the 1950’s when two professors, Richard Walden and Frank Lemon, first proposed studying the causes of death among Adventists in California, comparing them to American Cancer Society controls. Their proposal prompted a big debate – what if we weren’t healthier, if our unusual health practices were not beneficial? Fortunately the board gambled on Walden and Lemon, and their study became the foundation of the Adventist Health Studies that have now gained such acclaim for the benefits of the Adventist lifestyle. I certainly hope that today we do not fear this great search for truth, believing that the One who created us also knows all about our science and Bible and where it must eventually lead. So where does this leave us? Surely there are some absolutes that are unquestionable? Yes, I am sure there are, in both the Bible and science. But I am also convinced that we must continue to embrace a certain skepticism, a wondering in our souls, about many questions that are before us today. God has given us individually the power to think and question, to wonder and make decisions. Our church pioneers labored long and hard to filter out the essentials that established this church, but also taught the concept of “present trut h”, the idea that better understandings will come in the future. I am comfortable with that status, even though it leaves a certain uneasiness inside. My sense is that this is exactly the way God wants it, keeping me asking while still believing, having faith before the unknown, wondering while also certain of His care and guidance. In the current debate between theology and science, many of the issues seem insoluble and irreconcilable. The conflict has indeed been great at times in my own mind and experience as a student. I would like to share my perspective and journey as a student in both areas. In the Gospels, faith is both the preparation for and the product of Jesus’ miracles. The resurrection of Jesus is, of course, the supreme miracle of the gospel and is indeed the basis of Christianity. The grounds for believing in it are cogent, but no amount of evidence can convince those who at the outset assume the impossibility of such an event. In this essay we will seek to find a balanced, practical approach to the relationship between science and God's Word.